Last modified on January 23rd, 2018 by Vincy. 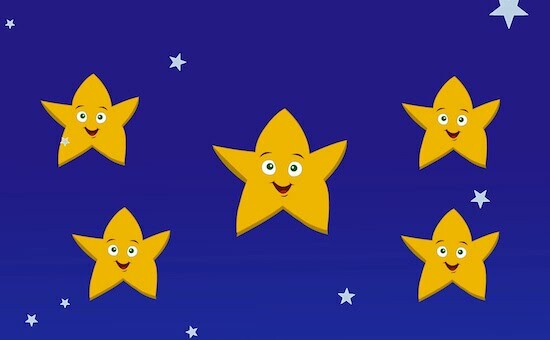 Star rating is used to rank pages, articles or posts published to the end user. This will help the user to identify and shortlist quality contents that are highly ranked. 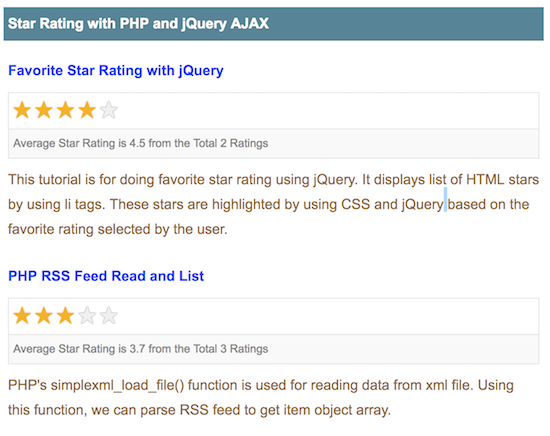 In this article, we are going to see how to create a PHP star rating system using jQuery AJAX. This article is an improved version of the existing linked code. In this example, I have calculated the average star rating from the total ratings added for each tutorial. This star rating example shows clickable five stars for each tutorial to add rating. The tutorials and their rating are stored in the database. I have stored the rating based on the member session. I hardcoded the member session id at the first line of the program. You can integrate your authentication module to replace this by the logged in user session id. This code is used to retrieve the tutorial data from the database and to list them with the star rating. I combine the tables tutorials and tbl_member_rating using LEFT JOIN to get the star rating along with the tutorial information. For each tutorial, I display the rating added by the user with the graphical representation of highlighting the stars. Also, I calculate the average rating out of 5 by using the overall rating added for the tutorial. <div id="tutorial-<?php echo $tutorial["id"]; ?>"
This jQuery code shows the functions used to handle the events triggered during the process of adding the star rating. For example, handling the hover effect to highlight and reset the star rating icons or handling the click event to add rating. The function addRating() is called on selecting the star icon to rate a tutorial. This function will send a request to the PHP code for adding the star rating for a particular tutorial with the reference of the tutorial id. This screenshot shows the star rating by highlighting the star icons. Also, it shows the average and the total ratings added for each tutorial in the database.